Everywhere in the Old Testament the joyous and harmonious notes of life are accentuated. Life is synonymous with good and blessing. This predominant note of happiness was undoubtedly the outcome of faith and of a complete dependence upon and trust in God the Creator of all. Happiness is to be found in the personal relation between man and his Maker: the closer this relation, the greater the happiness. "Blessed is the nation whose God is Yhwh (Ps. xxxiii. 12a). "In thy presence is fulness of joy" (ib. xvi. 11b; comp. ib. iv. 6 et seq.). Love of God and obedience to His Law are also conducive to happiness. "Hear therefore, O Israel, and observe to do it; that it may be well with thee, . . . and thou shalt love Yhwh thy God with all thy heart, and with all thy soul, and with all thy might" (Deut. vi. 3 et seq.). "Blessed is every one who feareth Yhwh; that walketh in his ways" (Ps. cxxviii. 1). "She [Wisdom] is a tree of life to them that lay hold upon her; and happy is every one that retaineth her" (Prov. iii. 18). Trust and confidence in God lead also to happiness. 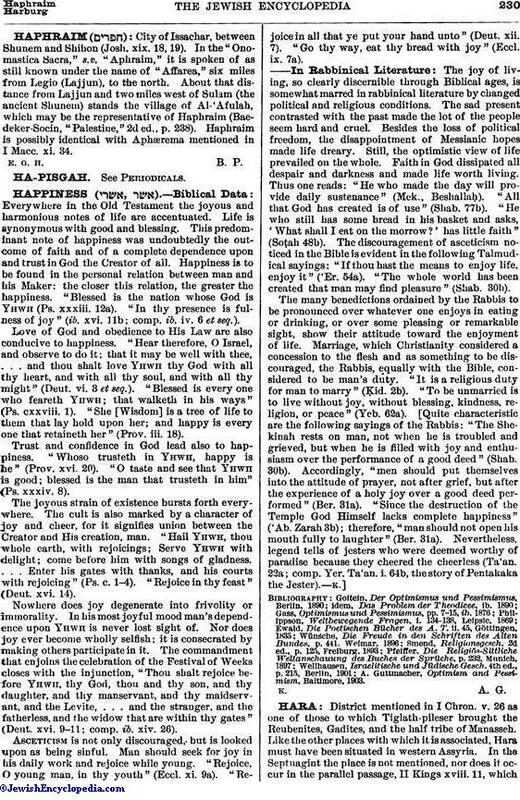 "Whoso trusteth in Yhwh, happy is he" (Prov. xvi. 20). "O taste and see that Yhwh is good; blessed is the man that trusteth in him" (Ps. xxxiv. 8). The joyous strain of existence bursts forth everywhere. The cult is also marked by a character of joy and cheer, for it signifies union between the Creator and His creation, man. "Hail Yhwh, thou whole earth, with rejoicings; Serve Yhwh with delight; come before him with songs of gladness. . . . Enter his gates with thanks, and his courts with rejoicing" (Ps. c. 1-4). "Rejoice in thy feast" (Deut. xvi. 14). Nowhere does joy degenerate into frivolity or immorality. In his most joyful mood man's dependence upon Yhwh is never lost sight of. Nor does joy ever become wholly selfish; it is consecrated by making others participate in it. The commandment that enjoins the celebration of the Festival of Weeks closes with the injunction, "Thou shalt rejoice before Yhwh, thy God, thou and thy son, and thy daughter, and thy manservant, and thy maidservant, and the Levite, . . . and the stranger, and the fatherless, and the widow that are within thy gates" (Deut. xvi. 9-11; comp. ib. xiv. 26). Asceticism is not only discouraged, but is looked upon as being sinful. Man should seek for joy in his daily work and rejoice while young. "Rejoice, O young man, in thy youth" (Eccl. xi. 9a). "Rejoice in all that ye put your hand unto" (Deut. xii. 7). "Go thy way, eat thy bread with joy" (Eccl. ix. 7a). The joy of living, so clearly discernible through Biblical ages, is somewhat marred in rabbinical literature by changed political and religious conditions. The sad present contrasted with the past made the lot of the people seem hard and cruel. Besides the loss of political freedom, the disappointment of Messianic hopes made life dreary. Still, the optimistic view of life prevailed on the whole. Faith in God dissipated all despair and darkness and made life worth living. Thus one reads: "He who made the day will provide daily sustenance" (Mek., Beshallaḥ). "All that God has created is of use" (Shab. 77b). "He who still has some bread in his basket and asks, 'What shall I eat on the morrow?' has little faith" (Soṭah 48b). The discouragement of asceticism noticed in the Bible is evident in the following Talmudical sayings: "If thou hast the means to enjoy life, enjoy it" ('Er. 54a). "The whole world has been created that man may find pleasure" (Shab. 30b). The many benedictions ordained by the Rabbis to be pronounced over whatever one enjoys in eating or drinking, or over some pleasing or remarkable sight, show their attitude toward the enjoyment of life. Marriage, which Christianity considered a concession to the flesh and as something to be discouraged, the Rabbis, equally with the Bible, considered to be man's duty. "It is a religious duty for man to marry" (Ḳid. 2b). "To be unmarried is to live without joy, without blessing, kindness, religion, or peace" (Yeb. 62a). Quite characteristic are the following sayings of the Rabbis: "The Shekinah rests on man, not when he is troubled and grieved, but when he is filled with joy and enthusiasm over the performance of a good deed" (Shab. 30b). Accordingly, "men should put themselves into the attitude of prayer, not after grief, but after the experience of a holy joy over a good deed performed" (Ber. 31a). "Since the destruction of the Temple God Himself lacks complete happiness" ('Ab. Zarah 3b); therefore, "man should not open his mouth fully to laughter" (Ber. 31a). Nevertheless, legend tells of jesters who were deemed worthy of paradise because they cheered the cheerless (Ta'an. 22a; comp. Yer. Ta'an. i. 64b, the story of Pentakaka the Jester). A. Guttmacher, Optimism and Pessimism, Baltimore, 1903.